Steven is not having the best of days on his journey to San Francisco via a Greyhound bus. He has just been brutally beaten and partially left for dead after being mugged by assailants, and left to the elements and fate beside route 101 in the small town of Willits, California. More worryingly for Steven, his backpack full of as-yet-unpaid for weed has been stolen by the assailants, and his suppliers aren’t exactly the most understanding of individuals when it comes to non-payment of goods received. “What the hell’s a matter with you, son? The owner of the so-called cool chuckle is a mysterious stranger named Quinn McFetridge who offers a helping hand to Steven in exchange for assistance in reuniting with a long lost girl named Teresa, in San Francisco. Quinn claims Theresa is his long-lost daughter, and she has hooked-up with some lowlife druggies and scumbags. He needs to rescue her before something unspeakable happens to her. He also fails to mention he is not long out of prison. With no form of transport and feeling lost and desolated, Steven gets in the car and begins the journey to San Francisco. It’s not too long before he soon realises that Quinn McFetridge is not the cool dude and good Samaritan he initially thought he was. In fact, Quinn has an agenda all his own, and he’s about to unleash a bloody vengeance at each stop along the journey, leaving the vineyards crimson with not just grapes and wine. With a coked-up sadist ex-cop named Maurice Trembley chasing Quinn, and two mismatched small town cops chasing Trembley, Steven is still unaware of the violent tempest brewing all about him. But that’s all about to change. Big time. Quinn’s a creator of nightmares, and he’s about to bring Steven alongside him in his latest creation of blood and mayhem. Trembley has been hired by Ricardo Alvarez, an alleged member of the Mexican cartel, whose bloody muscle reaches into the corridors of power itself, in San Francisco’s City Hall and beyond. This motley crew of murderers and corrupt cops have all one thing in common: Theresa and finding her first before anyone else does. But why is the young girl so important and with a bounty on her head? For now, Theresa’s luck is in. Steven finds her first, but in finding her first, he finds himself being sought after by those very people who wanted to capture Theresa, dead or alive. 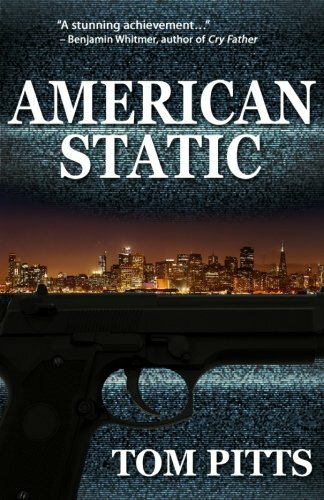 American Static is a relentlessly driven page-turning thriller with outrageous twists and turns you never see coming. Terrific one-liners and a truly original antagonist in the form of the violent Quinn, makes it perfect for the beach this summer.